It sounds like they’re trying to make more efficient use of their time when they say that doing this will ‘free up time for other work”, when what they really mean is it will free up time to campaign and fund-raise more. 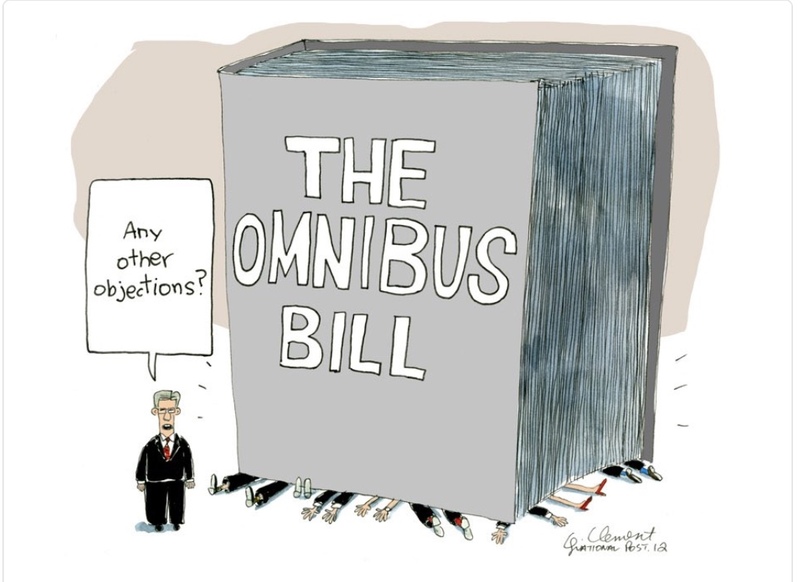 They’re already slackers by doing the omnibus budgets because they’re supposed to be doing individual annual budgets for each department, which they haven’t done in years. They also lose valuable opportunities to leverage trade-offs in spending. They only work 3-1/2 days a week as it is, so wanting more free time is a con job on the American people. Great post, Kathy. I hope people will read the rest of the article because Mr. Winfree makes some great suggestions for how congress could better use its time to do some rare good, but naturally he will be ignored by the fools that are running our country. I have lost any hope that congress will ever do right by the American people they pretend to represent, and with Democrats in charge of the House once again the only question is how much harm will they do? Thanks, CW. Congress pretty much wasted the last two years while they held the majority. There is so much they could have accomplished, and now we’re facing two more years of getting nowhere plus the additional waste of time and money on all the things the Dems plan to investigate. Mr. Winfree’s suggestions are good, but they fall on deaf ears when it comes to getting Congress’ attention. In the rare times that we have a majority, the opportunity is always squandered. Congress only want to make laws that will get them re-elected. They stay away from duties that might get them un-elected. That’s the crux of the problem. Things like budgets, tackling the national debt (Social Security, Medicare, Medicaid) immigration, these all get people unelected. Term limits don’t seem to help our congress critters. Exactly, tannngl. It’s all about elections and they say whatever is necessary to make that happen. Then when it’s time to do the budget they’re down there working at the 11th hour to get it finished, and right back to fund-raising, etc.